If any more life existed in this Chinese jar reef, it’d probably start growing over the sides. YouTube channel CoralFish12g founder “George” started reefkeeping back in 2008, and over the years he’s used his channel not only to talk about reefkeeping, but at times to feature the reefs of hobbyists from around the globe. 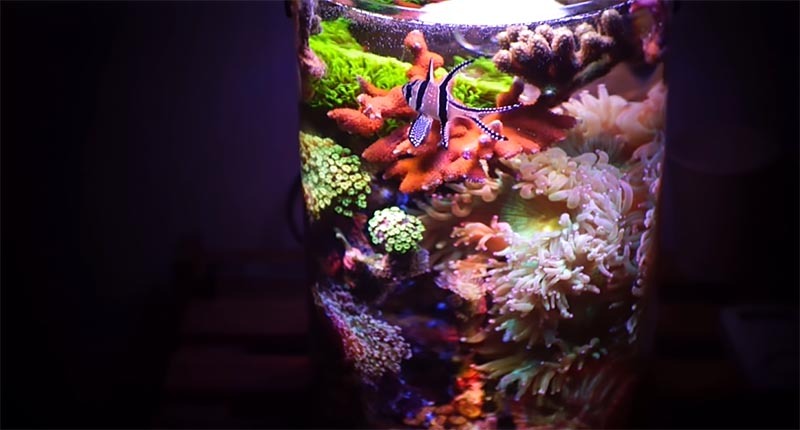 In this beautifully edited footage, George introduces us to the 2-gallon pico reef jar of Nano-Reef.com member Pongpitt Zhang, based in Guiyang, China. Pongpitt’s reef is well documented, including some amazing growth sequence photos, in a thread on the Nano-Reef.com website. This system volume is grown significantly through the application of an external canister filter, an Eheim Classic 150, which itself adds another 0.26 gallons (1 L) of overall capacity. The lighting consists of a DIY LED build utilizing 3W diodes, the mixture comprised of 3 blue, 2 white, and 1 purple. This is not dissimilar from the PAR38 style LEDs that are seeing widespread adoption for use on similar pico reefs. Reviewing Pongpitt’s documentation, it’s worth noting that he has changed fish selections on at least one occasion, when the Banggai Cardinalfish became “too big” and ultimately moved to another aquarium. The most recent update shows the aquarium housing a small Ocellaris Clownfish, although we suspect that this fish will have to be moved as it outgrows the tank if the coral growth doesn’t make it too cramped first!